Charming hotel with thermal baths. 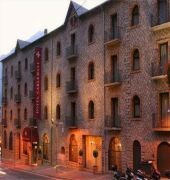 The Carlemany hotel is a select spa hotel in the Principality of Andorra. It is located in Escaldes, on the most famous avenue, at just 15 minutes from the ski slopes and at 300 meters from Caldea. It has 33 comfortable rooms with fashionable decoration. Furthermore, it also has a lounge with natural light, the best place for meetings. In the restaurant Au Bon Encontre, you can taste the best natural products. 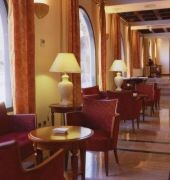 The hotel has parking and two heated pools in the middle of the mountains, where the guests have the opportunity of contemplating the beauty of the principality. Don't forget to spend your time in its hot baths and enjoy the best body and soul treatments.